When consumers are looking for product information or checking out new launches of their favourite brands, they often start their research directly on the brand websites. In order to convert these visits into purchases, more and more brands are investing today in a direct-to-consumer sales strategy and have established an e-shop on their brand website. Although demanding considerable efforts and investments, it is one great way to accelerate direct sales. However, this path covers only about 10% of the brand audience, as the majority prefers to purchase offline or via multi-product retailers online. If you don’t know in which specific retail shops the 90% of your brand audience likes to buy from, it will be hard for you to (re)target and to engage them efficiently. With regards to advertising, if you suggest only one purchase path from your campaigns, ie your e-shop, you are neglecting the preferences of a big part of potential buyers. And again, you lose track of them without any purchase path data that could help you fine-tune your marketing activities and offers. It’s a pity, because you could easily provide access to both your e-shop and your reseller network in the same brand contents to please all your potential customers to boost your business. At the same time, you would increase potential and qualified leads to your resellers, helping them also to sell more of your products – everybody wins! Many international groups like Philips, Groupe SEB, L’Oréal, PUIG, Henkel, LVMH and Jacobs Douwe Egberts have already realised the interests of this consumer centric approach. By offering more choices to customers, they generate more qualified leads, increase sales and get more shopper insights. Shoppable ads combine branding with commerce by providing consumers with a quick access to purchase options directly from the ad contents. The methods vary with regards to the redirection of the shoppers. Today, a lot of shoppable service providers in the market only allow a redirection to a one single online address, either the brand’s e-shop or one of their online retailers. Using this method is risky because if the suggested store happens to be out of stock or if the shopper prefers to buy from another retailer or offline, the user experience is quite disappointing. The brand most likely loses the prospect. The most complete and efficient method for advertisements is to allow the shoppers to get redirected to their preferred stores online or offline based on their geographic location. In order to provide a seamless viewing experience to the users and an uninterrupted purchase path control to brands, the in-banner / in-video technology is a must. This shoppable ‘where to buy’ ad technique with redirection to multiple retailers is invented by and unique to Swaven. The brand’s e-shop and/or resellers of the advertised product will be displayed inside the ad, and the user can choose his/her preferred shop whilst watching the brand content. Another interesting method consists of guiding shoppers from the ads to a dedicated landing page on which the brand can offer selected brand content on the product and several purchase options. This method is very useful for seasonal campaigns and for driving traffic from any social media, chat or email campaign to a dedicated shoppable page. It’s also a cost-effective shoppable solution for smaller brands that do not yet have an e-shop or for brands who wish to cover some markets in which they only sell through resellers. If your products are sold online and offline, it’s important to include redirection to both channels. Otherwise you lose a valuable number of leads and shopper data. 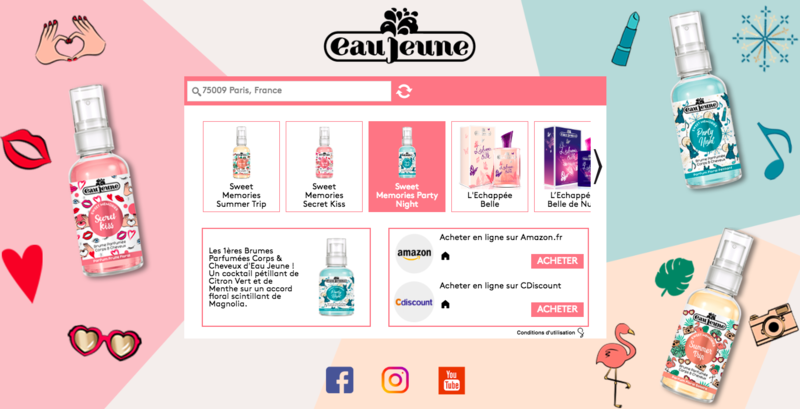 For its Eau Jeune brand, L’Oréal created a shoppable landing page powered by Swaven POP. It offers a convenient and a cost-effective way for the brand to guide all its audiences to purchase options with very little efforts and investments. If you prefer to redirect all your shoppers from your ads to your ecommerce site but would like to increase your sales and customer satisfaction, there’s an easy way to do this. On your product pages where you provide a buy button leading to your e-shop, simply add another option to get access to all online and offline resellers who have the product available. Jacobs Douwe Egberts has added an option on their L’Or product pages to allow visitors to access all resellers easily. Integrating Swaven’s multi-retailer shoppable solution to any brand content is extremely quick and simple. Our services are also fully GDPR compliant and certified by Google. In our next blog article we will tell you more about how you can also make your retargeting activities more profitable. Contact us to learn more about how Swaven can help you complete your ecommerce strategy and reach new performance levels.